Hot water systems for large dwellings can now offer fingertip control, save energy and use less water. Jon Palfrey explains. Over many years of sizing and recommending water heaters for large dwellings I’ve noticed a shift in end-user expectations. There is now an opportunity to combine a tried and proven solution that can be managed using new technologies and associated components. When a dwelling has multiple bathrooms, a ‘standard’ size continuous flow or mains pressure storage water heating system probably won’t have the required flow rate or recovery at peak times. At Rheem we believe a heavy-duty mains pressure gas storage unit on a reticulated ‘flow and return’ loop is an effective solution. Here I am referring to our 265L or 275L heavy-duty gas models for indoor or outdoor quick recovery. Let’s have a quick recap on how these units function. Heat from the burner under the cylinder is transferred to the water through the base of the cylinder and the wall of a primary flue that passes through the centre of the cylinder. A baffle in the primary flue ensures maximum efficiency. The thermostat operates the gas control by switching its power on and off to maintain a constant temperature. The thermostat is mounted externally on the water heater, and the protective over-temperature cut-out is mounted inside the lower front cover of the water heater. There is no need to switch the water heater off when it is not in use. The thermostat is fully automatic and allows the gas control to open only when the burner requires supply. The thermostat displays the current water temperature. Such water heaters incorporate an automatic burner ignition system. A hot surface igniter (HSI) probe automatically heats up when the thermostat registers that heating is required. The gas valve opens when the HSI probe is fully energised, allowing gas to the burner, which is ignited by the probe. The absence of a pilot light is a benefit for users, obviating unfamiliar re-lighting procedures. These water heaters can be installed at ground or floor level on a stable fireproof base acceptable to local authorities. The water heater must stand vertically with its back against or within 150mm of an external wall. Otherwise it can be against a fireproof screen extending at least 500mm above, below and to either side of the flue terminal. Failure to observe this precaution can cause flame retention issues in areas of high wind. The water heater must be positioned to ensure that the flue terminal location complies with of AS 5601 or AS/NZS 5601.1, as applicable under local regulations. The water heater should be installed at floor level and must stand vertically on a stable fireproof base acceptable to local authorities. The system must have sufficient fixed ventilation and be flued to correctly to remove combustion products. If damage to the property can occur in the event of leakage, the water heater must be installed in a safe tray. Construction, installation and draining of a safe tray must comply with AS/NZS 3500.4 and all local codes and regulatory authority requirements. AS/NZS 3500.4 has particular requirements when a safe tray must be installed. There are also special requirements in AS 5601 and AS/NZS 5601.1 for water heaters installed in a garage, an enclosed space and other locations. Remember – all local authorities have regulations regarding water heaters in roof spaces, and those regulations vary by region. It may be that the internal location of a Rheem 275 litre heavy-duty system raises compliance issues with AS5601. In this case, the system can be installed using a Rheem room sealed flue kit to provide a two-way balanced flue operation. The kit is designed to connect to a 631275 heavy-duty gas water heater, re-using the existing balanced flue terminal at a remote external horizontal location. The room sealed kit is designed to carry flue products up to 3m total length with up to three 90-degree bends. This eliminates the need for fan assistance when discharging flue products horizontally, or the need to run a flue to a satisfactory vertical discharge point (usually at the top of the building). Recent advances in technology allow the delivery of a water heater of this type to be controlled via a Bluetooth connection. The customer is able to control hot water recirculation during peak times. 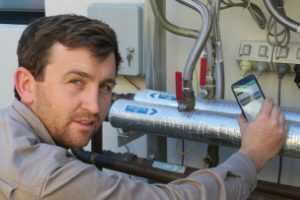 Tom Grant of Grants Plumbing in Melbourne researched the market for this control technology to combine the benefits of quick recovery and mains pressure delivery with fingertip control. The Australian-made Clipsal Iconic by Schneider Electric has a controller to activate a circulating pump for delivering heated water at mains pressure to all areas of a large domestic dwelling. The three-wire push-button Bluetooth Low Energy (BLE) and Wiser Room App connected products constitute the world’s first app-configurable modular electronic switch. This 24/7 scheduled delivery method provides the necessary volume of hot water as well as reducing water wastage and heat loss through fixtures and piping after draw-off, as occurs in a ‘dead leg’ system. Tom Grant recently installed and commissioned such a system in the refurbishment of a large house with multiple bathrooms. The versatility of a Bluetooth device, allowing a change in usage patterns to suit daily and weekly needs. Hot water being delivered quickly to all areas of the home via fingertip control. More consumers are looking to have hot water delivered quickly to taps or shower fixtures with consistent mains pressure, even if multiple fixtures are in use. A water heater installed on a flow and return loop can provide flexibility in the system location, with the pipe work ‘loop’ transferring flow via the use of a circulating pump. A flow and return loop with individual branches connecting to fixtures reduces the water waste occurring due to the excessive draw-off often experienced in a large dwelling (see diagram). Each branch delivering to a fixture can be tempered within AS3500.4 requirements via approved tempering valves, and the desired hot water is provided to kitchen and laundry areas. If the installation involves close temperature control for any purpose, or is providing water above 80°C, a circulating pump is essential. All valves and associated equipment must be suitable for safe operation up to the maximum thermal discharge temperature of the temperature pressure relief valve – that is, 99°C. A recirculation pump must be fitted. The pump must be capable of withstanding working pressures greater than 1000kPa and be made of materials resistant to corrosion in hot water. The pump should be installed with a full-flow service valve on the inlet and outlet sides. A non-return valve should be fitted in the recirculation line to prevent backflow of hot or cold water. The length of branch runs off the main recirculation line should be kept to a minimum, with the main loop and branches being well insulated. The installation of gas, electric and water services must comply with all relevant local authority regulations. The cold water supply pressure, or the setting of the pressure limiting valve, must not exceed the working pressure of the pump. Remember – when recommending the right water heater size and type for your next job, the methodology can be borrowed from roof plumbing design principles allowing for the ‘one hundred year storm’. You would never leave a roof without the required number of downpipes to provide drainage under heavy rain. The same principle should apply when installing a water heating system to serve the number of fixtures in a dwelling and to match the delivery and flow performance the customer needs and expects. When using a Rheem heavy-duty gas system in a dwelling, the cylinder warranty is extended to 10 years. Refer to the Rheem website for reference to installation instructions and training modules relating to such heaters. *This article was originally published in the summer 2018 edition of Plumbing Connection. Click here to subscribe.